Cumbria is a large county in North West England and contains the Lake District and Lake District National Park. It is bounded to the north by the Scottish Borders, Dumfries and Galloway, to the west by the Irish Sea, to the south by Lancashire, to the south east by North Yorkshire, and to the east by County Durham and Northumberland. Cumbria is very mountainous containing every peak in England over 3,000ft above sea level with Scafell Pike being England’s highest mountain at 3,209ft. Cumbria is also one of England’s most outstanding areas of natural beauty attracting mountain climbers, hikers and walkers, cyclists, runners and tourists from all over the world and holds a source of inspiration for artists, writers and musicians. Cumbria consists of six districts Eden, Carlisle, Allerdale, Copeland, South Lakeland and Barrow-in-Furness. 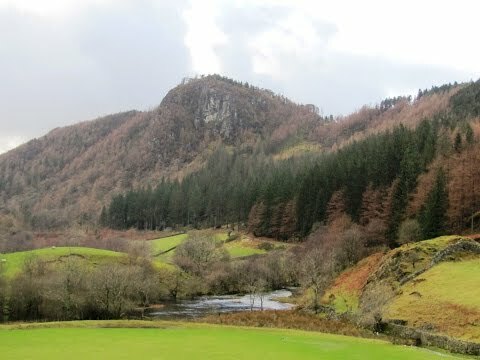 St John’s in the Vale is a glacial valley in the northern area of the Lake District with a number of farms, small settlements and several disused quarry and mine workings. St Johns Beck flowing through the vale is the main route of outflow from Thirlmere reservoir. This scenic and peaceful vale lies under the craggy slopes of the Helvellyn Range and is surrounded by many of the most striking Lakeland fells with Clough Head to the east and High Rigg and Low Rigg to the west. The northern end of the vale widens to meet the valley of the River Greta near Threlkeld and is dominated by the views of Blencathra and Skiddaw. The southern end of the vale is a narrow pass between High Rigg and Great Dodd. Red squirrels can often be seen in the woodlands around the vale. Legburthwaite is a small hamlet in the Allerdale District of Cumbria and is situated just north of Thirlmere reservoir. The village houses a church, a youth hostel and a National Trust car park with toilets and a picnic area. The valley and Thirlmere, on which no water sports are allowed, are a much quieter part of the lakes and there are some lovely peaceful walks and sign posted nature trails through the wooded areas on the western side of the reservoir and beyond there are many fells such as Raven Crag, Armboth Fell, Bleaberry Fell and High Seat. To the eastern side there is great Dodd, Stybarrow Dodd, Raise, Helvellyn and Dollywaggon Pike for the much more adventurous. The reservoir and surrounding forested valley are owned and managed by United Utilities, a private water and utility company. The views from down below in the valley or up in the fells are wonderful. Thirlmere water is a reservoir constructed in the 19th century by the Manchester Corporation to provide the industrial city of Manchester with water supplies. At the time there was strong local opposition for they thought it would dramatically alter the beautiful valley so the Thirlmere Defence Association was formed to oppose the parliamentary act. The organisation managed to stall the reading of the act in 1878 but the act was passed at the second reading a year later. The water level was raised by the construction of a dam at the northern end of Thirlmere in 1890 which took four years to build. The reservoir would now be able to supply water to Manchester via the underground Thirlmere Aqueduct approximately 100 miles long. The waterworks are now impressive and resemble a fort or castle. Thirlmere is 3.7 miles long and runs south to north and is bordered on the western side by a minor road and the A591 on the eastern side and before the construction of the reservoir the area was two smaller lakes, Leathes Water and Wythburn Water. Castle Crag and The Benn are subsidiary tops of Raven Crag. The summit of Castle Crag at 420.9 meters is the site of an iron-age settlement and provides a wonderful view of the valley of Shoulthwaite to the west and a close up view of Raven Crag. From the car park we head forwards past the telephone box and walk along the little road to the National Trust car park. We make our way across the car park to go through the gate and turn left onto the track. We follow the track over the bridge to the main road and then cross straight over taking the track opposite. After a short way we turn right at the public footpath sign and head towards the gate in front of us and turn right downhill with the wall on our left to cross over a little wooden bridge. We bear to the left following the fence line and a wall on our left. We go through a gate and walk between the buildings of Smaithwaite following the track to meet the road. We turn left and follow the road until we see the permissive footpath sign for Benn Loop. We turn right uphill over the stile and just a little further on we turn sharp left going steeply uphill on the track. When we come to a little stream and a deer gate on our right we turn right through the deer gate and keep following the track uphill. We go through another deer gate and cross straight over the track still heading uphill. At the top where the ground levels out we cross a track and go through a gate and head forwards over a little bridge. We see the sign for Castle Crag Fort and walk uphill to the top. We then make our way back downhill following the same route until we arrive back at the first deer gate we went through. We cross straight over the track and head downhill to the road. We turn right following the road for a short way and turn left at the y-junction to cross over the dam of Thirlmere reservoir. At the far side when the road bends round to the left we turn right at the footpath sign going up some steps. We are now on a permissive footpath going round the side of Great How rising up on our left with Thirlmere on our right. We head forwards following the side of the reservoir for about ½ mile then bear left away from the reservoir and when we meat a track we turn left and keep following the track until we meet the main road. We now turn right and follow the road on the grass verge back to our parked car. This is an easy to moderate walk on good paths, tracks and minor roads with some steep inclines and declines. Approx 5 miles allow 2 hours 15 minutes using OS Explorer map OL5, The English Lakes North-eastern area. Start point: Stanah Village Hall, free parking. Legburthwaite is in St John’s in the Vale near Keswick in the Lake District of Cumbria. From the A66 take the A591 or the B5322 heading towards Thirlmere Lake and Grasmere. The pay and display car park is on the B5322 just before Legburthwaite and the junction onto the A591. Free parking is in a lay-by at the side of the road on the A591 at the junction of the B5322. Parking: Free parking at Stanah village hall and lay-by on the main road. There is also a National Trust Pay and Display car park. There are public toilets and picnic areas in the National Trust car park and Swirls car park a little further down the road. The nearest refreshments are at The Kings Head a 17th century coaching inn situated on the A591 on the edge of Thirlmere. The next nearest refreshments are at Keswick, Threlkeld and Grasmere where there are public toilets as well.